A clinometer or inclinometer is an instrument for measuring angles of slope (or tilt), elevation or depression of an object with respect to gravity. It is also known as a tilt meter, tilt indicator, slope alert, slope gauge, gradient meter, gradiometer, level gauge, level meter, declinometer, and pitch & roll indicator. Clinometers measure both inclines (positive slopes, as seen by an observer looking upwards) and declines (negative slopes, as seen by an observer looking downward) using three different units of measure: degrees, percent, and topo (see Grade (slope)#Nomenclature for details). Astrolabes are inclinometers that were used for navigation and locating astronomical objects from ancient times to the Renaissance. In aircraft, the "ball" in turn coordinators or turn and bank indicators is sometimes referred to as an inclinometer. 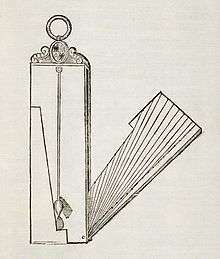 Drawing of an inclinometer, Museo Galileo, Florence. Inclinometers include examples such as Well's in-clinometer, the essential parts of which are a flat side, or base, on which it stands, and a hollow disk just half filled with some heavy liquid. The glass face of the disk is surrounded by a graduated scale that marks the angle at which the surface of the liquid stands, with reference to the flat base. The zero line is parallel to the base, and when the liquid stands on that line, the flat side is horizontal; the 90 degree is perpendicular to the base, and when the liquid stands on that line, the flat side is perpendicular or plumb. Intervening angles are marked, and, with the aid of simple conversion tables, the instrument indicates the rate of fall per set distance of horizontal measure ment, and set distance of the sloping line. One of the more famous inclinometer installations was on the panel of the Ryan NYP "The Spirit of St. Louis"—in 1927 Charles Lindbergh chose the lightweight Rieker Inc P-1057 Degree Inclinometer to give him climb and descent angle information. A forester using a clinometer makes use of basic trigonometry. First the observer measures a straight-line distance D from some observation point O to the object. Then, using the clinometer, the observer measures the angle a between O and the top of the object. Then the observer does the same for the angle b between O and the bottom of the object. Multiplying D by the tangent of a gives the height of the object above the observer, and by the tangent of b the depth of the object below the observer. Adding the two of course gives the total height (H) of the object. The forester stands at a fixed distance from the base of the tree. The most common distances in the United States are 50 feet (15.24 m) and 66 feet (20.12 m). To obtain accurate readings it is best to use taped measured distance instead of paced distances. For the most accurate readings it is best to use a distance that is not less than the height of the tree being measured, that is, that the clinometer will measure an angle less than 45° (100%). The observer sights to the top of tree, if total height is the desired measurement. 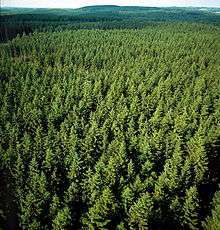 If the desired measurement is merchantable height—that is, the height producing timber that can be sold—the observer sights to a point on the tree above which no more merchantable timber is found. Note that the observer should use slopes expressed as a percent. The observer then measures to the bottom of the tree, again using percents. The observer than takes the slope to the top of the tree, and subtracts the slope of the bottom of the tree from it. Note that when the ground slopes downwards, the observer will record a negative slope to the base of the tree. When this is subtracted from the slope to the top of the tree, it is actually being added. These numbers are then divided by 100, and multiplied by the distance from the tree. There is still some error in this number, because the distance is measured along the ground, and is not the actual horizontal distance. By standing at the base of the tree, the observer should mark his/her eye level. They then stand back, and find the slope expressed as a degree to the mark. This is the slope of the ground. By taking the cosine of that number, and multiplying it with the previous number, the observer will calculate the height of the tree. The observer must always measure a leaning tree so that the tree is leaning to the left or right. Measurements should never be taken with the tree leaning toward or away from the observer because this will affect their accuracy because of foreshortening. 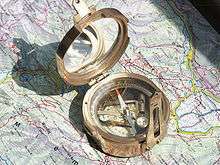 The clinometer is also commonly used by foresters to obtain the percent slope of terrain. This measurement is based on the same trigonometric principles described above. Slope measurements, however, require that both observer and target be a constant height above the ground; thus a range pole or height of measurement (HI) stick is often used in slope measurements. Certain highly sensitive electronic inclinometer sensors can achieve an output resolution to 0.0001°; depending on the technology and angle range, it may be limited to 0.01°. An inclinometer sensor's true or absolute accuracy (which is the combined total error), however, is a combination of initial sets of sensor zero offset and sensitivity, sensor linearity, hysteresis, repeatability, and the temperature drifts of zero and sensitivity—electronic inclinometers accuracy can typically range from ±0.01–2° depending on the sensor and situation. Typically in room ambient conditions the accuracy is limited to the sensor linearity specification. Tilt sensors and inclinometers generate an artificial horizon and measure angular tilt with respect to this horizon. 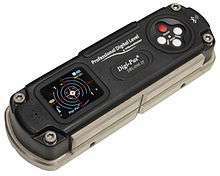 They are used in cameras, aircraft flight controls, automobile security systems, and speciality switches and are also used for platform leveling, boom angle indication, and in other applications requiring measurement of tilt. Important specifications to consider when searching for tilt sensors and inclinometers are the tilt angle range and number of axes (which are usually, but not always, orthogonal). The tilt angle range is the range of desired linear output. Common implementations of tilt sensors and inclinometers are accelerometer, Liquid Capacitive, electrolytic, gas bubble in liquid, and pendulum. Tilt sensor technology has also been implemented in video games. Yoshi's Universal Gravitation and Kirby Tilt 'n' Tumble are both built around a tilt sensor mechanism, which is built into the cartridge. The PlayStation 3 and Wii game controllers also use tilt as a means to play video games. Inclinometers are also used in civil engineering, for example to measure the inclination of land to be built upon. Some inclinometers provide an electronic interface based on CAN (Controller Area Network). In addition, those inclinometers may support the standardized CANopen profile (CiA 410). In this case, these inclinometers are compatible and partly interchangeable. Traditional spirit levels and pendulum-based electronic leveling instruments are usually constrained by only single-axis and narrow tilt measurement range. However, most precision leveling, angle measurement, alignment and surface flatness profiling tasks essentially involve a two-dimensional surface plane angle rather than two independent orthogonal single-axis objects. Two-axis inclinometers that are built with MEMS tilt sensors provides simultaneous two-dimensional angle readings of a surface plane tangent to earth datum. Two-axis MEMS technology enables simultaneous two-dimensional (X-Y plane) tilt angles (i.e. pitch & roll) measurement, eliminates tedious trial-and-error (i.e. going back-and-forth) experienced when using single-axis levels to adjust machine footings to attain a precise leveling position. Two-axis MEMS inclinometers can be digitally compensated and precisely calibrated for non-linearity for operating temperature variation resulting in higher angular accuracy over wider angular measurement range. Two-axis MEMS inclinometer with built-in accelerometer sensors may generate numerical data tabulated in the form of vibration profiles enable machine installer to track and assess alignment quality in real-time and verify structure positional stability by comparing machine's leveling profiles before and after setting up. Determining latitude using Polaris (in the Northern Hemisphere) or the two stars of the constellation Crux (in the Southern Hemisphere). Determining the angle of the Earth's magnetic field with respect to the horizontal plane. Showing a deviation from the true vertical or horizontal. Surveying, to measure an angle of inclination or elevation. Alerting an equipment operator that it may tip over. Measuring angles of elevation, slope, or incline, e.g. of an embankment. Measuring slight differences in slopes, particularly for geophysics. Such inclinometers are, for instance, used for monitoring volcanoes, or for measuring the depth and rate of landslide movement. Measuring movements in walls or the ground in civil engineering projects. Determining the dip of beds or strata, or the slope of an embankment or cutting; a kind of plumb level. Indicating pitch and roll of vehicles, nautical craft, and aircraft. See turn coordinator and slip indicator. Monitoring the boom angle of cranes and material handlers. Measuring the "look angle" of a satellite antenna towards a satellite. Adjusting a solar panel to the optimal angle to maximize its output. Measuring the slope angle of a tape or chain during distance measurement. Measuring the height of a building, tree, or other feature using a vertical angle and a distance (determined by taping or pacing), using trigonometry. Measuring the angle of drilling in well logging. Measuring the list of a ship in still water and the roll in rough water. Measuring steepness of a ski slope. Measuring the orientation of planes and lineations in rocks, in combination with a compass, in structural geology. Measuring the inclination angle of the pelvis. Numerous neck and back measurements require the simultaneous use of two inclinometers. Measuring the angles of elevation to, and ultimately computing the altitudes of, many things otherwise inaccessible for direct measurement. Measuring and fine tuning the angle of line array speaker hangs. Confirmation of the angle achieved via use of a laser built into the remote inclinometer. Commercial manufacturers of inclinometers include Rieker Inc, GeoSense, etc. ↑ Avery, T.E. ; Burkhart, H.E. (2002). "Height Measurement Principles". Forest Measurements (5th ed.). McGraw-Hill. p. 154. ↑ Williams MS, Bechtold MA, LaBau VJ (1994). "Five instruments for measuring tree heights: an evaluation". Southern Journal of Applied Forestry. 18: 76–82. Wikimedia Commons has media related to Inclinometers.